Palmetto Bug in the camper!!! Discussion in 'Let me tell you about my trip' started by Orchid, Nov 5, 2018. It got away, so went to Walmart for bug bomb. We had to sit outside for four hours. Can't even use the new propane fire pit for fear of explosion from the fumes. Watched The Accountant and some Western. Just came back in the camper. No insect corpses, but hope it left the same way it got in. I had to do a Google search for Palmetto Bug, CARP those things are big! If I had more than one of those in my camper I would have just burnt the camper to the ground. I wouldn't be able to sleep in the camper again, ever! It looks like that bug that was put in Chekov's ear in Star Trek II. Flamingo Guy, pudge, myride and 4 others like this. So you covered the inside of your camper with pesticide because of one bug? Was there food in there? Plates cups etc ? kitphantom and NMroamer like this. Its a big bug ! You need to get them before they get you. i visited my aunt in flordia. One came out from under the bed. Not fun.........thought it was a giant roach. Now i teach my daughter the bed bug song , just in case. Good night sleep tight, dont let the bed bugs bite. Didn't go over so well when the 1st grade teacher heard it, oh well. The fogger might be a better idea. Yeah, I've been in Florida visiting family and those things are huge and give me the creeps!!! Nothing like walking into the kitchen and see one of those on the counter looking up at you before you had some caffeine!!!! That's not a palmetto bug--that's a Madagascar hissing cockroach. They are way preferable to a real palmetto bug (also a cockroach, but different)!! Sorry, but it's big enough that it could grab a cane and top hat and do a dance across the counter!!!! myride, neighbormike and Orchid like this. I was staying at a hotel in Jacksonville several years ago, and I saw one in my room. I told the desk clerk that I had a big-a$$ cockroach in my room. He said "that's not a cockroach, that's a palmetto bug." Like that should make a difference, right? Yuck! Popiworks Paddle faster, I hear banjos! Had a friend that moved to Jacksonville FL who was setting mouse traps for the creatures. She thought they were mice until she saw one go up the wall. Orchid and silvermickey2002 like this. I'd rather deal with the roaches, than cats. Eek! I can handle a good number of bugs, but if it came to something as big as my hand... absolutely no way. I'd be sleeping in the car if I saw that in my camper. Nope, we took it all out to the van first. Then, yes we DID bomb the crap out of it. Found the corpse this morning, finally. No way was I sleeping in here with a palmetto bug! Have you seen one? They are like a cockroach except the size of a mouse! I was born and raised in Fl. 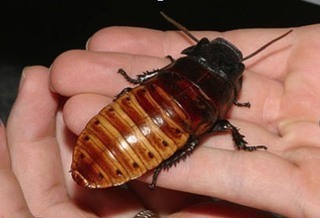 the Palmetto bugs are not the worst roach, those little German Roaches are the hardest to kill and the worst Roach to have, What ever Steve was holding was not a Palmetto bug, I am not sure what it is maybe Dingit is correct, Palmetto bugs do not get that big. We had pet roaches on one ship I was on and had roach races, we kept them in a match box and took good care of them until race time, I won $1.00 on one race but ole lucky lost the rest of the races so overboard my bug went. it broke the monotony for a while anyway. crackerJack, BillyMc, Orchid and 1 other person like this. I totally agree that I'd rather see a palmetto than a regular roach. With those little ones, you know thousands of their closest friends are hiding just out of sight. Even so, there was no way I could sleep in the camper with the knowledge a palmetto bug could potentially crawl on me in the night. We brought one home from FL this year in the camper. I grew up in South FL, I recognized it right away. I thought it was funny.